ASA Partners with AP&M for Member Discount to AP&M 2018! ASA to Exhibit at PBExpo in Fort Lauderdale, FL, May 16-17. Visit us at Booth #716. ASA to Exhibit at MRO Americas 2018 in Orlando, FL, April 10-12. Visit us at Booth #1317. Miramar Regulatory Workshop - Nov 7, 2017 Registration is Open! The 2017 Edward J Glueckler Award goes to: Ron Wolf, VP Operations of AerSale! ASA 2017 General Session Panels and Workshops Announced! ASA 2017 Time Saver Price Extended! Register today! ASA Adds New Time Saver Pricing Tier for ASA 2017 Conference. ASA Joins Industry Coalition Requesting the FAA Extend the Change 5 Implementation Date and FAA and EASA Include Exemption Statement from 8130-Requirement. 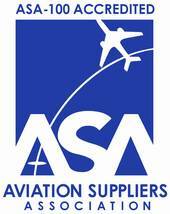 ASA Files Comments on FAA Draft AC 21.93. Read the draft as modified by ASA.